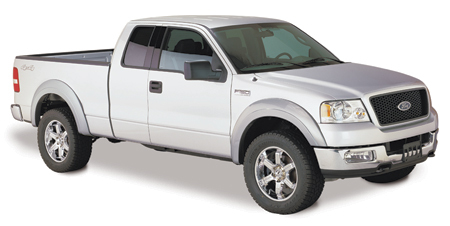 Bushwacker Extend-a-Fender - Complete Vehicle, Inc.
Give your truck a serious attitude adjustment and extra tire clearance with Bushwacker Extend-a-Fender Flares. These durable flares install without drilling for most applications and deliver a necessary defense from the junk that dings up your fenders. Big tires or small, if you just drove through the mud or down a gravel road, that stuff will be hitting your paint next. And, if junk's not blasting into your truck, it's being shot into the rig next to you. Beyond covering your paint, these American-made flares shroud huge, off-road tires and keep your truck free of fix-it tickets. Even the sun can't hurt your Bushwacker Extend-a-Fender Flares-they're made from ultra-durable, UV resistant, Dura-Flex® 2000 and won't crack, fade or warp over time. Best of all, Bushwacker Extend-a-Fender Flares come in a paint-ready OEM-style matte black finish, to perfectly match your rig's paint. Limited Lifetime Warranty.